As I am writing this review, I am also listening to the CD that accompanies this book: such a wonderful tool! I am taken to a place of calm and relaxation. It follows the three sacred blessings of Spirit that Choquette mentions in her book: Grace, Guidance, and Gifts. The CD is about 17 minutes long, and is perfect to play as going to sleep at night. Even though I have never read any of Sonia Choquette’s books, I have studied some of her articles and exercises found on the internet and her website (http://www.soniachoquette.com). And I have found her information on psychic abilities and intuition to be very powerful and enlightening. So it is not a surprise to me that this book would be such a great asset to spiritual study. Many of us today are self-taught Light workers. That is to say, there are many people who have not studied with a group of people under the tutelage of a spiritual teacher. And since there are so many books and resources such as this one, it is easy to have your own home study. I have encouraged many of my own psychic development students to have sacred time for themselves every day. This helps to raise the personal frequency of the energy field (aura). In doing so, it is easier to access your personal spirit teachers, guides, and angels. But more important, it helps you to access your own Higher Self. 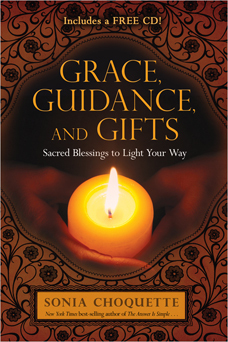 Choquette’s Grace, Guidance, and Gifts is a superb way to create or supplement sacred time and spiritual self-study. By using the book every day, you continue to contact Source through the Higher Self to receive Blessings in your life. She has the book divided into three sections: Grace, Guidance, and Gifts. With each section, there are prayers, a morning blessing, mantra for the day, and a personal message to speak out loud. Each section has about three weeks’ worth of daily study, and you can open the book at random to access each day. Or follow through from one day to the next taking in the book, step by step. The book is not meant to be read straight through, but to be savored as you progress through your studies. If you are considering starting your own sacred time and studies, wanting to have some spiritual discipline to your life, you would very much benefit from this book. However, her understanding here includes much of the Christian belief. So know ahead of time, if you are opposed to that particular teaching. Do you believe there is life after death? Or do you believe that once your body dies, that’s all there is? There have been way too many historical and antidotal experiences to deny death survival. But that is what this documentary is all about: The Debate. BJ Barretta, producer and filmmaker, has put this age-old discussion into documentary format. And let me tell you… he has brought all the heavy hitters in for the discussion! “Surviving Death: A Paranormal Debate” includes British paranormal guru and ghosthunter Richard Felix, psychic medium Michael Tottey, the guys on The PSI Show, including Dan Sturges, Loyd Auerbach, parapsychologist and professor at Atlantic University, and The Reverend Father Jerry Wooton (Holy Trinity Catholic Church, Gainesville, VA). What a lineup! Paranormal experiences are explored from scientific, parapsychological, theological, and entertainment points of view. Soooo……. Why not join the conversation???!! I already have! There is a Discussion Forum on the main website: Surviving Death: A Paranormal Debate Just click on the link and scroll to the bottom of the page. There are several topics listed and I am sure you’ll enjoy the lively discussion! Being a psychic medium, I have my own point of view. And I have evidence that no one can talk me out of. What about you? 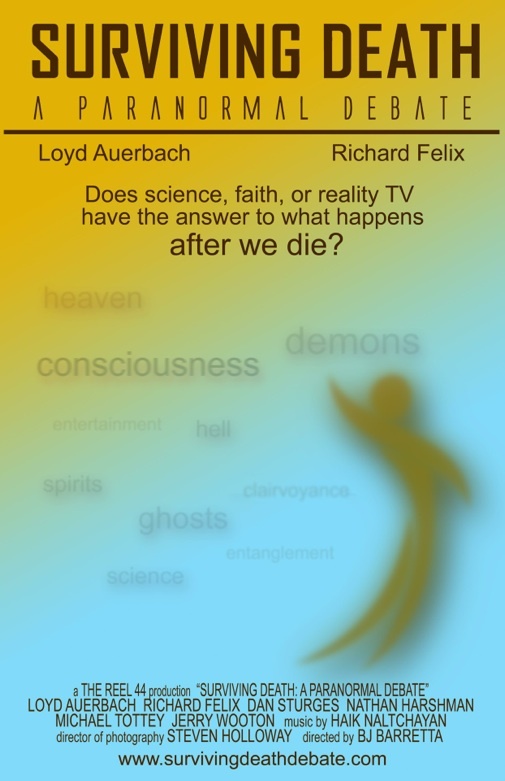 Surviving Death: Is There Really Life After Death? There are plenty of ways to meditate. But I think the most important thing is for you to just do it. Sometimes it seems like you can’t sit still, or your mind wanders. That’s okay! After you keep practicing and are dedicated to doing it everyday, your mind will realize it can benefit from a few moments of quiet time. And it will allow you to do the thing you wanted to do in the first place! I feel it is most important to have a simple plan to start off with. Create a special (sacred) space in your bedroom, or corner of a spare room. Use it only for spiritual pursuits. Soon that place will have a lighter vibration, and you will move into your meditation easier. You don’t always have to make your mind “not think”. Just do something that requires your undivided attention. It could be reading or writing poetry, sitting in a yoga position, or concentrating on peace or love. Meditation is simple and easy. Enjoy it!